We are always encouraging our members to continually be upskilling themselves to become more confident on and off the beach. Circular 12 – Gold Medallion Assessments Season 2018-2019 for pre-requisites and registration requirements. The aim of the course is to provide participants with the skills and knowledge to participate in search and rescue operations. This course includes participating as a team member in aquatic searches, specialist rock rescue techniques, and a night search and rescue operation on land. Click here for SMAR course and registration details. If you are interested in becoming a Drone Pilot/Operator, please contact captain@wandaslsc.com.au for further information. Applications are open for the Australian Institute for Disaster Resilience (AIDR) Volunteer Leadership Program which is being offered at various locations across Australia. These are very worthwhile, free leadership development courses where members get to network with like-minded volunteers from a number of other agencies. Please note that participants are responsible for the cost of their return travel to the program location. Full details can be found here. For enquiries, please contact Greg Taylor (AIDR) on 03 9418 5274 or email events@aidr.org.au. 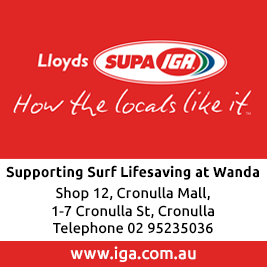 Click here to access the Surf Life Saving Sydney calendars.